Freelance horse racing writer Teresa Genaro epitomizes a press corps that never puts its pencils down. Her work is popping up all over, from the pages of Forbes, to The Saratogian, to The Blood-Horse−a spread that’s as wide as the Hudson. On Monday, the indefatigable reporter had a front page story about the planned modernization of the Adelphi Hotel. 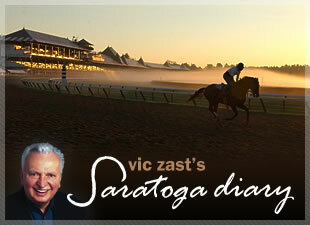 On Tuesday, she wrote in the Pink Sheet about how the Travers (gr. 1) went on as scheduled even though Gov. Andrew Cuomo wasn’t present. At this time next summer, the old Adelphi should look spanking new in its rooms and appointments. Its new owners are promising to return the nostalgic hotel to its rightful place on Broadway as the city’s most iconic building. Should Northshire Bookstore of Manchester Center, Vt., take up space in the shuttered Borders a few doors to the north, as is rumored, the west side of the street may soon rival the east side in popularity. With a new Maestro’s restaurant in the Rip Van Dam and Druther’s Brewery drawing drafts in and fans to its beer garden, the block between Washington and Division streets has flourished. Regarding Genaro’s story on the governor, there will be disagreement. “No-Show Cuomo” had no choice but to snub the New York Racing Association. It would not have been politically astute for him to rub elbows with people whose behavior he publicly chastised and whose employment he may soon eliminate. Yet, you didn’t have to be in the press box with Genaro to read into her piece the blood boiling beneath her fingers as she pounded the keys on her laptop while writing about his alleged truancy. He’s a polarizing figure with the future of the sport in New York in his crosshairs. The stands were near empty again at the racecourse on Monday. Jockey Joel Rosario took longer than expected to return to the Saratoga winner’s circle after day-hopping to Del Mar to ride Dullahan to victory in the Pacific Classic (gr. I). He won the seventh race aboard 15-1 Sensational Appeal. 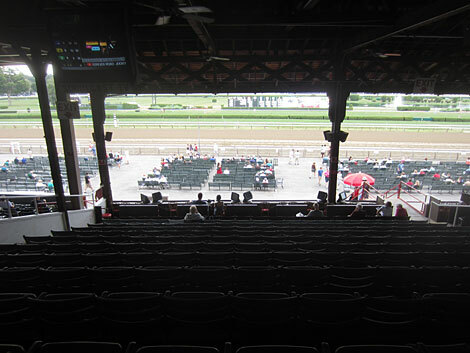 End of season racing at Saratoga means empty seats. Section L in the Clubhouse, race 4. There were more accomplished winners than See Me Proud in the sixth race, but none prettier. By pretty is meant the bay son of Proud Citizen was pretty in pink−pink quarters and hoops on his rider’s silks, a pink and grey cap on his rider’s head, the pink number eight saddlecloth and four pink leg bandages to boot. 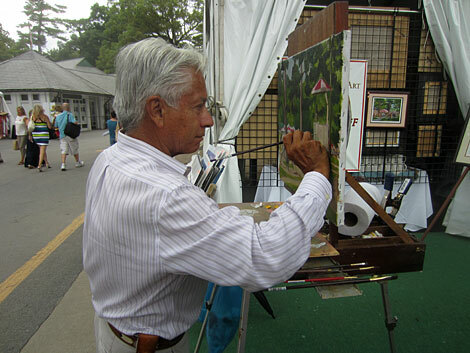 Equine artist Nick Martinez has been selling pretty paintings at Saratoga for 25 years. “It’s been a stellar year−the best I can remember,” he said, despite having his booth moved to the far end of the trinkets ‘n trash row of tents that lead to the Carousel. “Business is good because I work,” he explained. Simple concept. Equine artist Nick Martinez at work at the track.